During 2003, the economy of southern Indiana continued to perform better than state and national economic trends. The New Albany area actually experienced a net job gain over the past year, as the unemployment rate has begun to decrease. The seven counties in the Louisville Metropolitan Statistical Area (MSA) are Clark, Floyd, Harrison, and Scott counties in southern Indiana and Bullitt, Jefferson, and Oldham counties in northern Kentucky. In 2003, the U.S. Census Bureau redefined the counties in the Louisville metropolitan area to include Clark, Floyd, Harrison, and Washington counties in southern Indiana and Bullitt, Henry, Jefferson, Meade, Nelson, Oldham, Shelby, Spencer, and Trimble counties in Kentucky (see Figure 1). 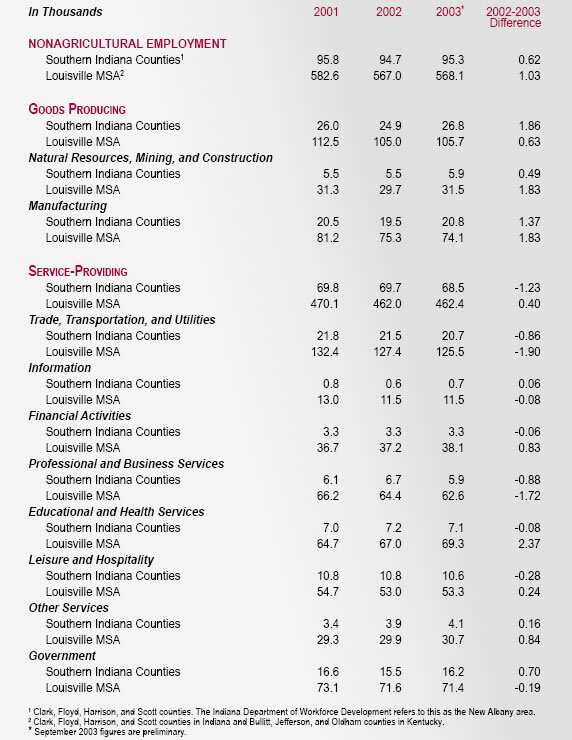 Since most of the metro area statistics do not yet use the new definition, the following analysis uses the 1999 MSA configuration to examine various measures of economic growth in the Louisville MSA and its component counties. Three additional Indiana counties—Crawford, Jefferson, and Orange—in the southern Indiana labor market area are included when data is available. The 2003 unemployment rate in the counties of the Louisville area have continued to decline over the year, and with the exceptions of Washington and Orange counties, the unemployment rate continues to be below that of Indiana as a whole and below that of Kentucky and the United States, as shown in Table 1. The total number employed has steadily increased over the course of the year. The unemployment rates in Clark and Floyd counties are currently among the lowest in the state while the unemployment rate in Orange County is among the highest in the state. 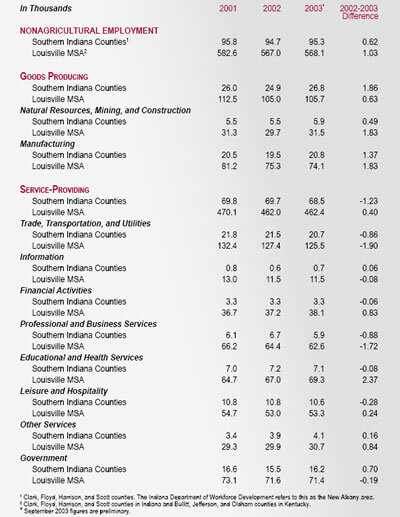 Recent data for the Louisville MSA indicates that the average level of nonagricultural employment was 568,100 for January to September 2003, an increase of just over 1,000 jobs from the same period last year (see Table 2). The Indiana portion of the MSA contributed just over 600 jobs to this increase. Total nonagricultural employment in the southern Indiana counties averaged 95,300 well below the May 2001 peak of 98,200 jobs. Contrary to the state and national situation, employment growth in southern Indiana was actually led by manufacturing, which increased by an average of 1,300 jobs. The service sector was hit hard over the past year, decreasing by an average of 1,200 jobs. The decrease in service employment was led by professional and business services, followed by trade, transportation and utilities, both decreasing by over 800 jobs. The average level of government employment increased approximately 700 jobs over this same time period. The increase is attributable to state and local governments, with state government employment increasing by about 240 jobs and local government employment increasing by about 490 jobs. Recent commuting data released from the 2000 census indicates that 35,532 workers commuted daily between southern Indiana and Jefferson County, Kentucky, in 2000. Approximately 3,475 more workers commuted from southern Indiana to Jefferson County, Kentucky, in 2000 relative to 1990 (a 10.8 percent increase). Table 3 shows the proportion of commuters originating in each county and commuting to other counties. Manufacturing is the only sector for which wage and salary information is collected for the southern Indiana area. Average hourly manufacturing earnings in southern Indiana have increased over the past year, but remain consistently below that of the MSA as a whole. While there is no standard measure of labor productivity for metropolitan areas, national averages suggest that labor productivity in manufacturing has increased substantially over the past, which would boost wages. Average weekly hours worked in the manufacturing sector averaged 43.2 hours per week for the first three quarters of 2003, slightly below the 2002 average of 43.7 hours in southern Indiana, suggesting a portion of the increase in average earnings is due to overtime pay (see Figure 2). Manufacturing hours peaked at 44.1 hours per week in April 2003. Sales and Marketing Management magazine’s 2003 survey of buying power shows that changes in retail sales are mixed (see Table 4). Total retail sales in the Louisville MSA decreased by 3.8 percent, from $12.9 billion in 2002 to $12.4 billion in 2003—a smaller decrease than for the previous period. Jefferson County, Kentucky, had the largest change with over a $404,000 decrease between 2002 and 2003. Floyd, Harrison, and Scott counties show substantial growth in retail sales. Harrison County is the only county in the MSA where retail sales have increased over the past four years. The increase in retail spending in Floyd, Harrison, and Scott counties may indicate a redistribution of spending patterns. As more retail establishments have opened in these counties, consumers shop there rather than traveling to Clark County, Indiana, or Jefferson County, Kentucky. Activity in the residential housing market increased slightly over the past year. Housing sales through October 2003 in the southern Indiana area (1) totaled 2,441 compared with 2,144 for January to October 2002. The average sales price was $130,224 for January to October 2003, up 0.5 percent from the year before. The average amount of time for a house to sell was 113 days, up slightly from the 2002 average. Residential construction as measured by residential building permits for new single and multi-family residential units continues to be strong increasing by 9 percent and 20 percent, respectively, for the MSA counties for the January to September period (see Table 5). Clark and Harrison counties experienced a decrease from the same period in 2002. Other counties show increases. Floyd and Scott counties have particularly strong growth in percentage terms for single family permits (30.3 and 36.7 percent, respectively). This growth in residential housing should lead to a continued increase in retail spending in these counties. Interest rate increases, as projected in the last half of 2004, are likely to dampen growth in residential building permits. Gaming at Caesar’s Casino continues to expand. The turnstile count for January through September 2003 was over 2.5 million, a 12.7 percent increase over the same period in 2002. Tax payments totaled $68.53 million for the January to September 2003 period, a 31 percent increase over the same period in 2002. 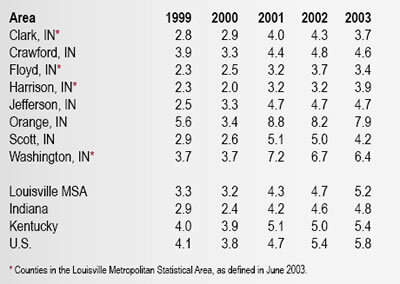 During 2003, Louisville and southern Indiana entered a period of moderate growth. While retail spending remains sluggish in several of the metro counties, single family residential building permits and housing sales have increased relative to the previous year, but will likely taper off over the coming year as interest rates increase. Unemployment rates have declined and employment growth in the nonagricultural sector is creeping upward, although the numbers are still quite volatile from month to month. Moderate employment growth should continue. The coming year should generate an additional nine hundred jobs on average in the nonagricultural sector of southern Indiana, and unemployment rates should continue to decrease slightly. Data on home sales from the Southern Indiana Realtors Association Multiple Listing Service, which covers Clark, Crawford, Floyd, Harrison, Jefferson, Scott, and Washington counties.